My oldest son, Trey, is a junior in college and he worked for me this summer. Trey’s job was helping our overworked staff answer phones. It was a huge help, and everyone loved having him in the office. 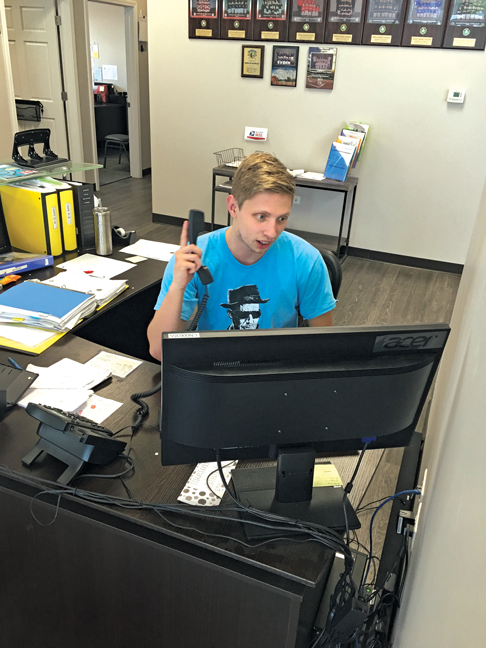 Trey was a natural on the phones, and within just a few days he had learned our online software (can you hear the Proud Papa voice oozing through my column here?). The only thing Trey had trouble handling was the ability to deal with upset customers. 1. Keep in mind they may be having a bad day. It happens to the best of us. The toaster breaks, the car won’t start, the kids are staying home from school because they are sick, the worlds aren’t aligning right and everything is going wrong, including that mouse that just ran across the kitchen counter. Because the mouse was the client’s breaking point, you are going to be the recipient of their angst. 2. Humor them. Let them vent. Sometimes people just need to let off some steam. Don’t take it personally when they are upset. Many clients will calm down after a few minutes, and actually appreciate your patience. 3. Humor them, Part II. Make them laugh. This is my speciality. I will say something so silly or ridiculous that the client has to stop and ask themselves, “Did he just say what I think he said?” I never say anything risqué or scandalous, but it will be funny and maybe a little inappropriate. I also never belittle them or make fun of their situation. I’ll just crack a joke relevant to the problem, and hopefully get the client giggling. 4. Find common ground. A sincere “I know what you’re saying …” works especially well when a client is upset about a bill or our pricing. We all have bills, and I’ll remind our clients that I have a kid in college and another approaching college age. We have to charge what we charge because I have bills to pay, too — electric bills, chemical bills, insurance, etc. 5. Educate them. If a customer is upset that they are still seeing carpenter ants after one treatment, we will explain complete metamorphosis to them. If they get bent out of shape over a dead mouse in the basement, we will teach them about anticoagulants. Nothing calms down a client more than having confidence in a product or process. 6. Don’t cave in to their hysteria. I recently had a client nearly hyperventilating over one carpenter ant in her kitchen. She demanded that we return immediately. I calmly, but firmly, explained to her that we would not be racing to her home every time she saw a bug. First, the insect would be dead soon from our pesticides. Second, one forager does not mean she has a nest in her home. Third, her great cooking was probably attracting ants. Silly joke = giggling client. 7. Don’t get into a shouting match. No one wins in this situation. The more you shout back, the angrier the client gets. Most customers don’t want to be bullied on the phone, and they will react accordingly. 8. Don’t immediately be on the defensive. Maybe they really do have a legitimate beef with your company or the services provided. Set up an extra service and investigate the situation. In our company, we have a motto: “We love extra services!” Normally, extra services means something is going wrong at the client’s home. At Schopen Pest Solutions, we flip the extra service into an upsell. 9. With age comes wisdom. My office manager, Laura Lentz, and I were talking about this subject recently and it really is true. The older you are, the more patient you tend to be with rude people. Sometimes it’s just wiser to be quiet and listen. Feel free to make faces and stick your tongue out at the phone. 10. Always speak with a smile on your face, even on the phone. It’s hard to stay mad at someone who sounds happy or is smiling at you. If you are smiling, the sound of your voice changes. Even though I try reaaalllly hard to make every client happy, not all customers are fans of Pete Schopen Jr. I have one particular client, a lady in Arlington Heights, Ill., who refuses to speak with me on the phone. A couple of years ago, she repeatedly rescheduled her services — so after the fifth or sixth attempt, I canceled her. She called up, furious with me for canceling her because even though I wasn’t sympathetic to her busy schedule, she still loved the work we provide. Ever since, she will only call my schedulers and receptionist. If I answer — we have caller ID — she will hang up and call back. Shockingly, she’s been a client for 11 years straight!